‘Firewitch’ cheddar pink was voted the 2006 Perennial Plant of the Year. The cultivar name ‘Firewitch’, is English for ‘Feuerhexe’, the original German name. 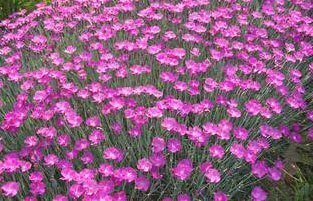 This easy-to-grow perennial, like other pinks and carnations, has flowers with a fragrance of spicy clove. Dianthus or Cheddar Pink ‘Firewitch’ has low-growing, bluish-gray leaves that stay evergreen in most climates. Its flowers are bright purplish to magenta pink and bloom for weeks in mid-spring. The plant has a mat-forming habit of growth, with leaves that get about three to four inches tall. The flower stems, which cover the entire plant when in bloom, reach about eight inches tall. This Cheddar Pink is hardy from USDA Zones 3 to 9, and easy to grow in full sun and well-drained soil. Avoid planting it in poorly drained conditions, or heavy wet clay. You can encourage more flowers by shearing off the finished blooms right after flowering in mid-spring. This promotes a second flush of color in summer – and if you shear them again, you will even get flowers in early autumn. As with most perennials that rebloom, the first flush of color is at its best early in the season. A low-growing perennial like Dianthus ‘Firewitch’ is great edging plant for flower beds or the herb garden. It also grows beautifully in the rock garden or between stones in dry stone walls, or when used as a ground cover in a sunny area. ‘Firewitch’ combines well with lamb’s ears, threadleaf coreopsis, low-growing sedums, artemisias, creeping thyme, creeping phlox and low-growing ornamental grasses like blue fescue (Festuca glauca) cultivars.